The CMS estimates were made prior to the announcements of 2017’s final COLA and Part B increases. 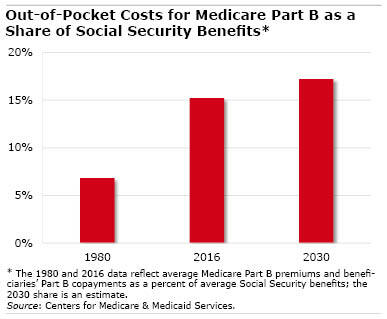 But the trend of eroding benefits was confirmed by Juliette Cubanski, associate director of Medicare policy for the Henry J. Kaiser Family Foundation. “This should raise some red flags among people who may not be realizing about the need to save more. Social Security, while it’s a vital source of support, might not stretch as far as it used to,” she said. Cubanski also noted that CMS’ estimates do not include the financial pressures on seniors from another rising medical cost: prescription drugs. Strictly for comparison’s sake, consider that Kaiser estimates the Medicare program’s per capita expenditures for the Part D prescription drug benefit will increase 5.8 percent annually over the next decade, exceeding the 4.6 percent annual increase in per capita Part B expenditures. In truth, the impact on individual retirees from COLAs and medical costs vary widely. For example, there is some protection from increases in Part D drug premiums, because seniors can search for less expensive drug plans during open enrollment each year. The federal “hold harmless” provision that caps Part B premium increases at the dollar increase in Social Security benefits check didn’t apply to higher-income retirees. But for the majority of the baby boomers making their financial plans for retirement, be aware of the incredibly shrinking Social Security check.